We’d love your help. 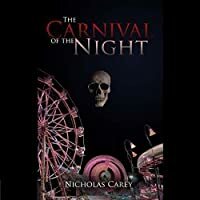 Let us know what’s wrong with this preview of The Carnival of the Night by Nicholas Carey. Christopher, the latest arrival thrust reluctantly through t Some call it purgatory, others know it as the in-between, but for those poor souls who are trapped there eternally, it is simply The Carnival — a macabre mockery where night is never-ending, and a sadistic creature known as The Fool reigns unchallenged. To ask other readers questions about The Carnival of the Night, please sign up. This book uses language really well sometimes, especially homophones in one part, but it could use further editing in order to make the idea that the author was going for there really shine. Don’t get me wrong, the book isn’t chock full of typos or anything, and the formatting was just fine, but there were a few grammatical errors here and there, but the ones that really caught my eye happened to be in a place where language and its usage was quite important. Purgatory is a carnival filled with evil? I imagine for some, a carnival could be thought of as a place between heaven and hell. The funhouse has never been much fun - it’s almost like touring a haunted house any day of the year. Games at this carnival are taken to extremes. We know all the games at fairs, carnivals, arcades, etc. are rigged - it’s become part of the challenge. However, ensure you follow ALL of the rules if you don’t want to become part of said game. I want to comment from so man Purgatory is a carnival filled with evil? I imagine for some, a carnival could be thought of as a place between heaven and hell. The funhouse has never been much fun - it’s almost like touring a haunted house any day of the year. Games at this carnival are taken to extremes. We know all the games at fairs, carnivals, arcades, etc. are rigged - it’s become part of the challenge. However, ensure you follow ALL of the rules if you don’t want to become part of said game. I want to comment from so many different angles, but I’m afraid of giving something away. This story is written in such a way that specific puzzle pieces are carefully handed over at precise moments. Family feuds are involved. Mythology plays a large role. Then there’s self-discovery, friendship and atrociously sung sea shanties. My story to finding this book is pretty unique compared to the other books that I've read. Instead of getting a friend recommendation or finding it on Goodreads' lists, I was on Reddit. On my front page, I saw that there was an announcement from this person saying that their novella was finished. Being a pretty avid reader, I was interested. After reading the first chapter, I was very intrigued. I was very happy to find out that it's free on Kindle Unlimited, and I started reading it. I'm very happy that I did. Important note: There will be spoilers for the first few chapters of the book. Because of how short the book is, I would recommend looking into it here if you like fantasy. The Carnival of the Night is about Christopher, a poor soul (literally) who got hit by a car while biking and died. Now he's in purgatory, led to it by the daughter of death. Chris hopes that he can move on to heaven, and Cassandra (the daughter) wants to help him. This is the very beginning of the book, and Chris's goal changes as you get into the book. The Carnival (which is purgatory) is an awful place to be. Run by The Fool, there are normal carnival games made gruesome. For example, there's the classic game of throwing balls at clown heads or pins to try to knock them down. But this time instead of normal balls, they have spikes. And instead of pins, they have live human heads. Because nobody can die in purgatory, these heads have full consciousness. Chris gets saved from whatever "the pit" is (probably worse than that ball game) by a Cowboy named Derek, who wants Chris to help him around his stall. His stall is the "shooting at ducks" game, with a caveat. You might've guessed it, but the ducks are people and the guns are real. This game is actually one of the more humane ones, we've been told. 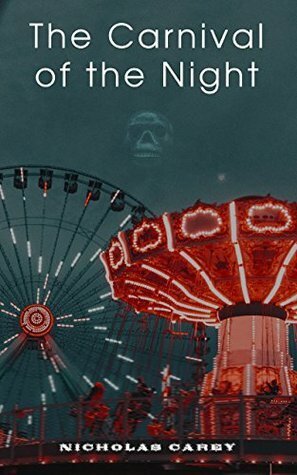 If you're not scared off by those wonderful carnival games, you should know that I really enjoyed this book. As somebody who only reads fantasy, this was a really enjoyable read. I loved how dark and gruesome the book was, and the story itself was pretty good and very original(as far as I know). For example, it's really funny to think of Death as this reaper who lost his love of his job and is now basically a desk worker. There's a pretty good revelation a good way into the book, albeit a bit stereotypical. I really liked all of the characters, each with their own mini backstory. Every person is in purgatory because their death was not normal. The book follows Greek Mythology to an extent, with the Titans and Zeus etc. Reading how powerful the demigods (children of the gods) are is really fun. One final aspect that I liked was the writing. The characters were full of personality, and the book openly swore when appropriate, which isn't something you see often. This writing is one of the main reasons that I really enjoyed the book, along with the amazing setting and characters. I have one main problem with this book: It's not fu- . . . It's not damn long enough. I really enjoyed this book, and while reading it I was constantly like "this is not going to last. :(". The story felt a little rushed as well. There was never a break from important event to important event. Also, I remember there were a few times when the grammar didn't seem great. Lastly, this might just be because of who I am, but there were a lot of times where the fact didn't add up/ logically something wouldn't happen. For example, this book falls victim to the "I'm so exhausted I can barely move. Oh wait, now I'm motivated! Horray, now I'm fine." trope. Another thing is there were monsters in a chapter at the very beginning, but they're never mentioned once after. These were not that common, but it's something that I pay attention to and it gets under my skin. A short, but interesting book. The writing is mostly well-done with some typos and formatting issues that are hopefully fixed in a future update. Fair warning to anyone planning to read this book it is surprisingly dark and violent with frequent swearing. The story is quite unique. I've never come across a depiction of Purgatory like this before, and that alone made it worth reading for me. The author, Nicholas Carey, manages to fit quite a few noteworthy characters from varying mythologies into A short, but interesting book. The writing is mostly well-done with some typos and formatting issues that are hopefully fixed in a future update. Fair warning to anyone planning to read this book it is surprisingly dark and violent with frequent swearing. Christopher ends up in purgatory, also known as The Carnival. Once he discovers what it's like in there, and the stakes are raised far beyond his own existence, he knows he has to escape. There are some familiar characters in this tale, Death being one of them, but also some new takes on old ideas. Death's daughter, for example. This is a great story. Definitely worth checking out and in my opinion the descriptions of the dark carnival games are worth the cost of admission alone. A much different take on purgatory; the in-between becomes a horror show. The book has a great story but the last 30 pages seemed like the fast forward button had been skipped. If the ending had been drawn out, it would have been much more satisfying. So glad I purchased this book!!! This is the first book that I've read by this Author and it will definitely NOT be the last! This story kept me entertained and invested from the first chapter. I only hope that these characters have a chance to appear in a future book. Nicholas Carey is an English author who writes fantasy and sci-fi stories, in which he is able to imagine the impossible or unlikely - such as the sun coming out in the village where he lives. You can visit his reddit page for more information on current stories: http://reddit.com/r/nickofnight Nicholas Carey is an English author who writes fantasy and sci-fi stories, in which he is able to imagine the impossible or unlikely - such as the sun coming out in the village where he lives.